“A world-class research environment, a high-profile attraction and a new city district for everyone to enjoy. Only at Dokken is this a possibility,” says Tor Fredrik Müller, general manager of the company Visjon Dokken. Along with Asplan Viak, Probiz and MAD Arkitekter, the company has pointed out the opportunities afforded by the city’s container docks. “At Dokken, the marine sector has the chance to grow. Here, there is room for a world-class research community, academia, business start-ups and established enterprises. Together, they can form a cluster within one of the most important sectors for the Norwegian west coast, and one with the best outlook for growth and development,” says Müller. He also believes that integrating the Aquarium into the scheme can help turn the cluster into a high-profile attraction, right at the centre of a completely new city district that everyone can enjoy. 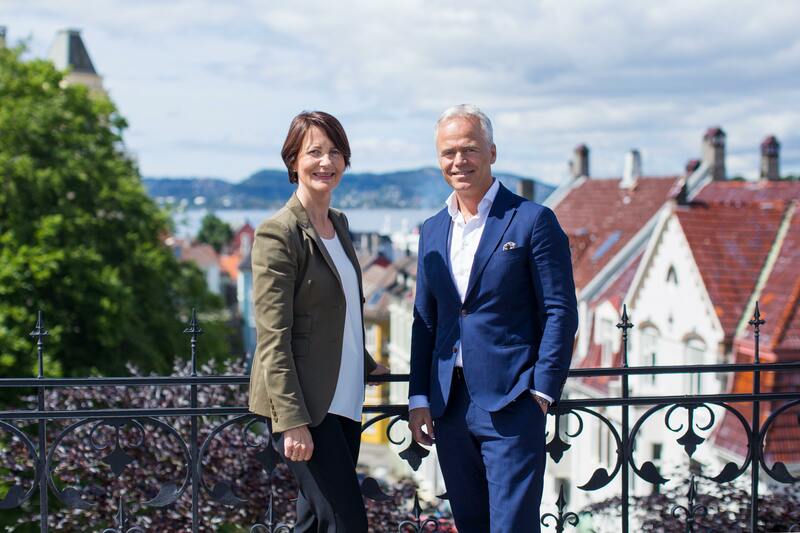 Jorunn Nerheim, regional director at OBOS, and Tor Fredrik Müller, CEO of EGD Property and general manager of Visjon Dokken. Marineholmen to Nøstet as one single transformation area. “Proximity to the university is important, which makes Dokken an ideal space where the cluster can develop and grow over time,” says Jorunn Nerheim, regional director at OBOS. According to Müller and Nerheim, parallels can be drawn with the successful recent redevelopment of Oslo’s Bjørvika district. The whole thing started with the decision to build the new national opera house there. That became the locomotive which unleashed an enormous potential. Finally, Visjon Dokken highlights the chance to build a sustainable urban district where containers currently hold sway. This is Visjon Dokken’s vision of how the area currently occupied by container docks could be transformed into a marine cluster. Cleaner fish are increasingly being used at fish farms to combat sea lice. In 2016, around 20 million wild-caught wrasse were used at Norwegian fish farms. Lumpfish are also used.